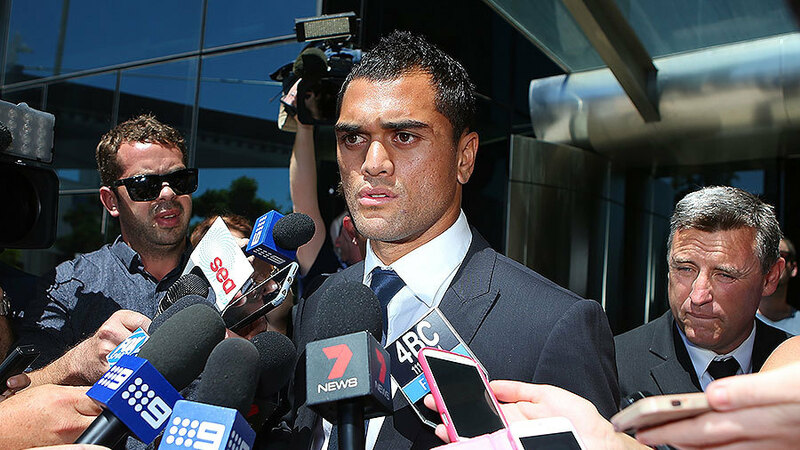 Karmichael Hunt says being labelled a dobber has been even harder to deal with than facing cocaine-related charges. The three-code football star says he has spoken to all of the former Gold Coast Suns AFL team-mates he named to the Queensland's Crime and Corruption Commission (QCCC) since his statement to the QCCC was leaked a week ago. Hunt insists they were understanding and realised he had no choice. "I've spoken to every player that was named, every one of them," Hunt told News Corp. "They all appreciate the position that I was in. They're fine. They know the type of person I am. They realise I only did what I had to do. That's the Suns boys and my [current] team-mates at the [Queensland] Reds." Leaking of Hunt's statement sparked speculation that the 28-year-old father of three may have named players with him at the Suns' Mad Monday in late August and on a golf trip to the Sunshine Coast in order to receive more lenient treatment. "It's definitely been the toughest week on me and my family," he said. "Even tougher than when I was facing the original charges. Purely because of the suggestion of dobbing on my mates for personal gain. The disappointing thing is that sections of the media are making me out like a snitch or a rat and that I dobbed my mates in to get myself out of trouble. "That's just not the truth. When a detective rocks up to your home and presents you with a demand to turn up and talk, what choice do you have?" Hunt said he owned up to everything from the outset and admitted when under oath to the charges of ordering the drugs and possessing the drugs. "They ask what did you do with it, who was I with, they want every little detail," he said. "If you lie to the Queensland CCC about who you were with you can go to jail. If you refuse to answer you can go to jail. If you choose not to answer a question you're locked up until you do. It's the law." The cocaine scandal stemmed from the time before Hunt joined Super Rugby's Queensland Reds late last year. Hunt was arrested on charges of supplying cocaine in February and a month later was fined $2500 by the Southport Magistrates Court and ordered to have drug counselling after pleasing guilty to possessing cocaine in September and October last year. He also copped a six-week ban from the Reds and was stripped of his vice-captaincy, fined $30,000 by the Super Rugby franchise and ordered to have drug counselling. Included in an initial Wallabies train on squad, Hunt was left out of coach Michael Cheika's 40-man squad named last week for the opening two Rugby Championship Tests.